There are a few famously great pairings in life: Mork and Mindy, ketchup and fries, movies and popcorn — and airplane flights and a beautiful glass of wine. This season, Alaska Airlines is introducing a new West Coast wine menu to complement their fresh-and-local seasonal cuisine. This selection will continue to rotate, introducing new and interesting wines from the West Coast, where more than 90 percent of U.S. wine production occurs. Alaska Airlines has the most nonstop flights from the West Coast and is committed to partnering with noteworthy local winemakers. 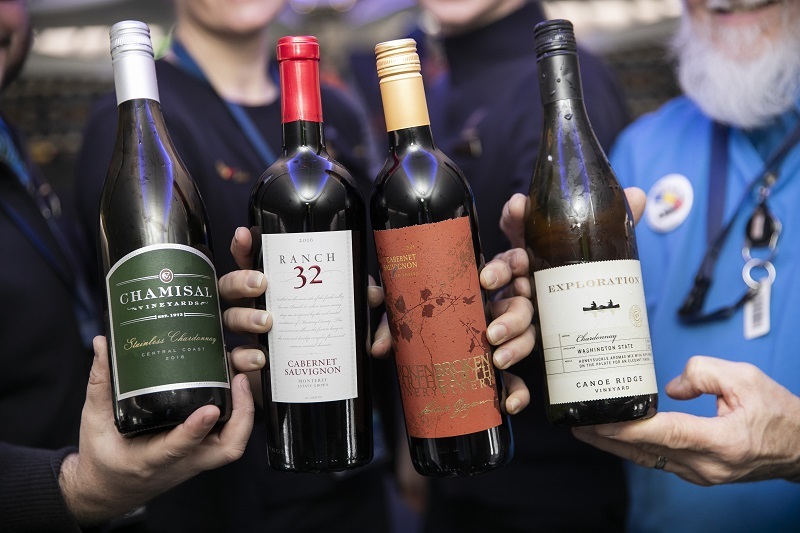 To find the very best selection, the Alaska Airlines food and beverage team reached out to wineries up and down the West Coast in search of high-quality wines that shine at 35,000 feet. The team went through a long and thoughtful process, not only to find the right wines but to partner with the wineries who share Alaska’s values around quality and sustainability. Developing those relationships with wineries allows Alaska to offer great West Coast wines to their guests. After identifying potential wines, the team then called on the expertise of certified sommelier Jonathan Hardy — a veteran of the restaurant industry for more than 15 years and now the lead sommelier at Stoneburner in Seattle’s Ballard neighborhood. Together, Hardy and the team tasted each of the potential wines before making their final selections. “We really looked into what would play well in the air when you’re thirty- or forty-thousand feet up,” said Hard. When looking for the right wine, particular focus was placed on those with flavor profiles that would pair well with Alaska’s food options. Out of reverence for the winemaker and the passenger, they looked for wines that would taste the same at high altitude as on the ground: usually, wines with lower levels of acidity, higher levels of sugar, less tannins, and bigger, velvety mouthfeel. “We looked for wines more voluptuous in texture, not so dry, and softer all around,” added Hardy. Located just 10 minutes from San Luis Obispo, California in the cool and temperate Edna Valley, Chamisal Vineyards has been making wine since 1973 and today is committed to using sustainable practices in the winemaking process. Compared to other spots on the Central Coast, this valley region boasts a longer growing season — 2016 was an especially long harvest — allowing the grapes to mature longer on the vine. This produces much more deep and intense flavors, particularly compared to other wines you’ll find in that part of California. This extra time for maturation pays off in a few ways for this Central Coast Chardonnay: a beautiful bloom across the palate of ripe pineapple, Gala apples, pear, and candied lemon. As an unoaked wine, the wine finishes crisply with clean aromas of fig. Award-winning Ranch 32 has produced a Cabernet Sauvignon with bright fruit flavors that’s perfect for kicking back on the plane. Grown in Monterey, California, the wine yields notes of black fruit, vanilla, and mocha — and smells like blackberries, currants, and plums. Aged in a barrel, the process creates a long, smoky oak finish. Just imagine a nice piece of chocolate cake or a drizzle of hot fudge with a sip of this meaty wine. Broken Earth Winery comes straight out of warm Paso Robles, California, where the winemaker grows, ages and bottles the wine. Big wines present well at cruising altitude, and this 2014 Cabernet Sauvignon delivers with a full body of dark berry fruit and big oak flavors. Take a deep whiff of the glass, and you’ll find hints of tobacco and cedar along with blackcurrant. The menu will continue to feature Canoe Ridge Exploration Chardonnay as the white selection for the main cabin, and with good reason: The winemaker has earned over 13 90+ Best Buy scores from Wine Spectator. Originating from Horse Heaven Hills along the Columbia River, this South Central Washington Chardonnay opens with the fragrance of honeysuckle and offers ripe pear on the palate. Try all of the wines and let us know what you think! Have other favorite pairings while you travel? Let us know in the comments below. 13 comments on "Rich, full-body West Coast wines on board Alaska Airlines flights this winter"
Dear Alaska, you guys do a great job getting me safely from point A to point B. All of the luxuries you provide are cream. Thank you for hiring competent, knowledgeable pilots and attendants who know when to make a decision affecting our lives. Coming from someone who travels in the extreme Arctic of Alaska on Ak Air, it is much appreciated. I’m a big snacker but find the snacks offered in first class on a long flight weird.The popcorn is flavorless (Erin’s is better), and frankly if one is snacking, why not serve a NW favorite, Tim’s Chips? Please retire that old Chardonny and bring back Pinot Grigio or Sauvignon Blanc! PLEASE!! I appreciate the efforts you make to select wines that would appeal to the broadest group of travelers. It cannot be easy to to do that with so much great wine available here and with such differing tastes. I have several wine club memberships with small wineries in Washington and Napa. It would never be my expectation that I would find that kind of wine on a flight. The logistics of planning a menu that gets printed and does not change frequently means sourcing a suppler who must be able to guarantee a certain level of production for the duration of the contract. I’m in the foodservice business; I understand the challenges. For those who wish a different wine, I suggest having a nice glass of wine before you board. For me, I appreciate all price points of good wine and will continue to purchase a glass inflight. Thank you, Alaska. I am happy with your selection. What happened to Napa-Sonoma? Wines known all over the world, and if I was flying in from a foreign land it would nice to taste a wine from that region. Really Alaska Really, the same old Chardonnay and Cabernet Sauvignon. Really, there are other varietals available you know. Like a Gewerztraminer, Viognier, Moscato, even a Pinot Gris with higher sugar levels that would taste amazing at altitude in a dryer cabin. But no, your Sommelier picks out the same old, same old sorry, beaten up varietals that are so tired it is pathetic. Call me, I can help you here!! I also am a Sommelier with airline experience. Kim is right! The cabins are so dry, a little sugar would go a long way. How about the Allure Moscato by Warren G? Magic on the nose, and g-funk forward! I love it, and I think everyone else loves really really sweet wines. Call me, I can help you regulate your selections! Thanks AK Airlines! Fantastic wine selections and a strong new plane design/marketing image from Alaska in general. Enjoying a glass currently ex-SEATAC. Hats off to Hard and the team behind the new menus, layout, and customer involvement throughout the process. Cheers! Maybe you could start by asking your customers what they would like, instead of some self-proclaimed expert. Just a foolish idea, I know. Wow, with allllllll the great wine available, especially in washington state, i am not sure how you all settled on these four. I recommend you look for wines from small wineries. Ones that produce 10,000 or fewer cases a year. You will be supporting smaller and start up wineries and get much better wine to serve. I’m looking forward to trying the Chardonnay!